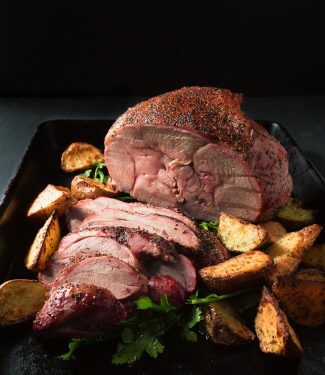 Grill roasted leg of lamb is a great way to bring summer flavours to a wintery cut of meat. The Greeks know this. They have since about the beginning of time. Whole lamb on a spit over a fire is a Greek party classic. This is just as good – just on a smaller scale. Smoke kissed lamb seasoned simply with garlic and rosemary with a lemon jus. Hard to beat. Grill roasted lamb. There are a few things to consider here. Bone-in leg of lamb is impossible to cook evenly. Just look at a leg of lamb critically some time. It’s huge at one end and tiny at the other. Makes cooking a turkey seem like a cakewalk. 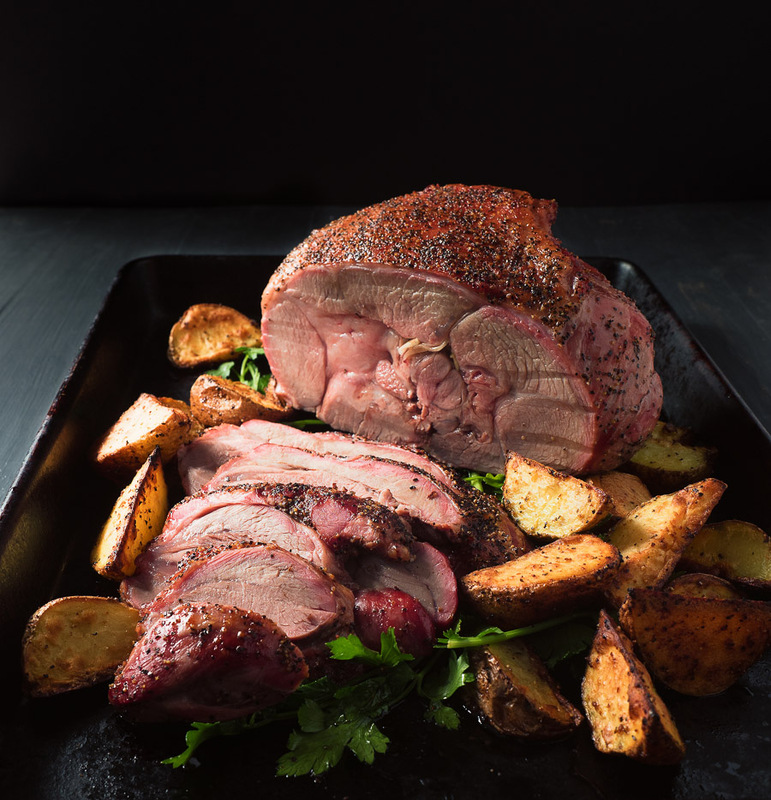 Use boneless leg of lamb and it’s way easier to get evenly cooked grill roasted lamb. Dry-brining works wonders with lamb. Seriously. Absolute magic. Plan on allowing 36-48 hours to season the meat through and through. It makes a difference. As with any big hunk of meat, a lower cooking temperature helps a more even cooking process. Rotate it along the way to offset any hot spots on the grill. Finally, this is about lamb and smoke. Charcoal smoke. I have no idea if this will work on a gas grill. I cook using charcoal. It might work if you add wood chips. I don’t know. This is not a recipe that will make lamb haters into lamb lovers. But for those on the fence, grill roasted leg of lamb is a recipe to win them over. 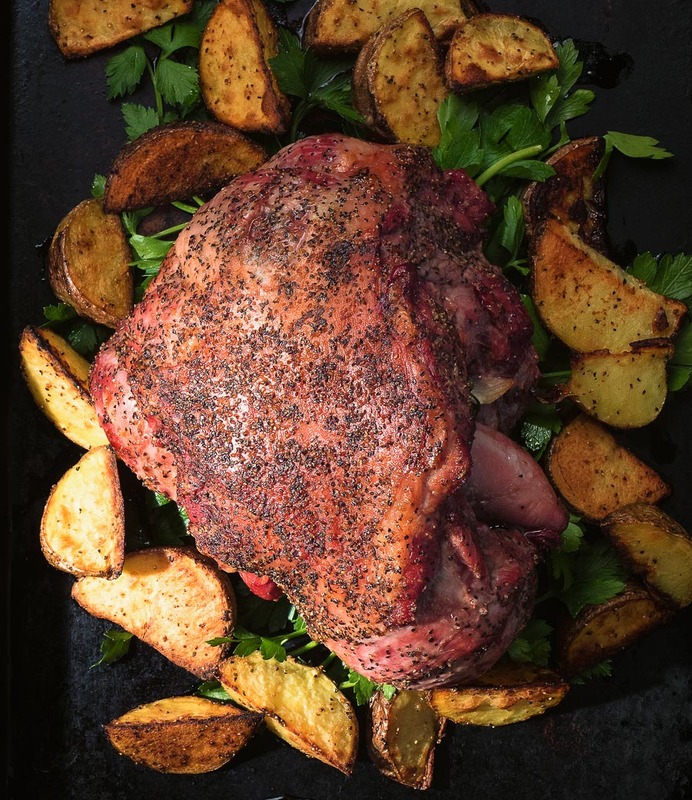 Grill roasted leg of lamb is a fantastic summer dinner to share with good friends. 1 leg of lamb - boneless. Try boning one out yourself sometime. It's a fun learning experience. Sprinkle the lamb with the salt. Wrap it in a plastic bag and put it on a cookie sheet. Stick it in the fridge for 36 hours, turning it over every 8-12 hours. Just let the magic happen. Set up your grill for indirect heat. You want to target 325F and stay there if you can. If there was ever a recipe that favours a kamodo, this is it. If you are using a different style grill, plan to add charcoal along the way. Remove the leaves from 2 sprigs of rosemary. Tuck them into the flap where the bone was along with the garlic slices. Season the lamb generously with coarse ground pepper. You don''t need any more salt. Place the lamb in a roasting pan and roast it until it reaches an internal temperature of 130F, about 70-90 minutes. Spin the roasting pan every 20-30 minutes to manage any hot spots on your grill. Remove the lamb from the pan and let rest, covered, for about 20 minutes. Strain the pan juices and spoon off any obvious fat. Return the juices to the pan along with the lemon juice. Bring to a simmer. Carve the lamb across the grain. Pour any accumulated board juices back into the pan with the lemon sauce. Serve the lamb with a drizzle of sauce. In american, bbq and grilling, main course, meat. Bookmark the permalink.